Which Decade Is Tops For Pops? – Year 7 – the Number 5s. As ever on “Which Decade”, it’s the Key Marginals in the earlier rounds which can swing the whole match. So far, the big tussles to watch are Shontelle vs Driver 67 in the Number Tens, Moz vs The Prodge in the Eights, Adams/Chisolm vs Nash (also in the Eights), and Starr vs Brown in yesterday’s Sixes. Just one set of votes can tip the balance, earning or losing crucial cumulative points for certain decades. So if you’re late to the contest this year, don’t worry; your votes are as vital as anyone else’s. I can’t say that it’s ever occurred to me before, but Wikipedia’s suggestion that The Move‘s Roy Wood composed “Blackberry Way” as a gloomy riposte to the location-specific optimism of “Penny Lane” is, on the face of it, quite a plausible one. From “there beneath the blue suburban skies” in early 1967 to “absolutely pouring down with rain, it’s a terrible day” in early 1969 – was this a Metaphor Of Post-Flower-Power Disillusionment For Its Times, or are we over-analysing again? …and perhaps significantly better, if this kind of dismal muzak is the competition. Oh Hank, how COULD you? Then again, I think Hank knew what he was doing. This pointless cover of Julie Covington’s classic (a “Which Decade” winner from two years ago) might have surgically sucked all the soul out of the song – but it also returned The Shadows to the Top Five for the first time since “The Rise And Fall Of Flingel Bunt”, fifteen years earlier. Thus emboldened, they charted again two months later with an equally icky take on “Cavatina” from The Deer Hunter – which once again showcased Hank’s new, weird and downright ridiculous “pluck a single string as if it were the pinnacle of artistic endeavour” technique. I’d show you all this in moving images – but the shadowy cabal behind the fun-loving Shads are clearly a thorough bunch, making this the first of this year’s tracks which I was unable to source on video. Never mind, though; the brief snippet on today’s MP3 medley should suffice. Dymbel and I will be seeing The Shadows in concert later in the year, reunited with Cliff Richard for their 50th anniversary tour. As long as there’s plenty of stuff like “Flingel Bunt” (go find it on Spotify, it’s GREAT) and a bare minimum of dreck like this, then we should be happy. Ee, this ain’t half dated badly. Did this really fill my dancefloor at Eden every week? Why did I buy the album? And how did the album ever get to Number One? What were we thinking? Several plays later, and its simple charms have won me over again. The song may not look like much on paper, but there’s a smiling, un-selfconscious joie de vivre at work here, which it would be churlish to resist. Two years on from the anti-climactic demise of Frankie Goes To Hollywood, it was good to have Holly back on top of his game. As it turned out, his commercial comeback didn’t even see him through to the end of the year – but I always felt that was Holly’s choice; to switch priorities and saunter gracefully off the public stage, before we started getting bored with him, and he with us. If it’s smiling, un-selfconscious joie de vivre that Tatyana Ali is aiming for with “Boy You Knock Me Out”, then I’d say that she almost, a-l-m-o-s-t, hits the target. But not quite. There are some agreeable touches, but at heart this is imitative rather than inspired, with Will Smith’s cursory contribution seemingly tacked onto the end by the marketing department. For yes, there is a TV tie-in connection: for several years, Tatyana had played Will’s young cousin Ashley on the hit TV series The Fresh Prince of Bel-Air, and towards the end of its run her character had been preparing for a singing career. Indeed, in the last ever episode, Ashley had enrolled at a performing arts studio in New York City. So, there’s a cute “life imitating art” angle at work – but does it make “Boy You Knock Me Out” any more interesting? Or does it underline the track’s more contrived aspects? 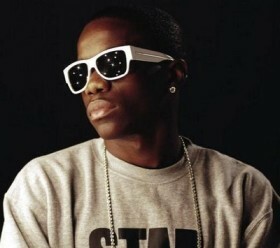 It seems to be the pre-ordained fate of every UK grime act – Tinchy Stryder included – to have a surprise Top Ten hit with a genre-junking mainstream dance collaboration. Dizzee Rascal teamed up with Calvin Harris for “Dance Wiv Me”; Wiley sampled a classic garage house anthem for “Wearing My Rolex”; and now Stryder has joined forces with the successful jobbing hack Taio Cruz for “Take Me Back”. My votes: The Move – 5 points. Holly Johnson – 4 points. Tinchy Stryder featuring Taio Cruz – 3 points. Tatyana Ali featuring Will Smith – 2 points. The Shadows – 1 point. Over to you. The Seventies have nudged fractionally ahead, but I suspect that Hank and the Shads will cost them dear. The Sixties have made up a lot of lost ground, moving from fourth to third to second… and after today, maybe to first place? And barring a miracle, The Nineties might as well give up and go home right now. So come on, Tatyana! Do yer bit! Running totals so far – Number Fives. Blimey, 1969 is walking away with it in my neighbourhood so far! Am I really that ready for Radio Quiet Gold? Then again, so much of 1969, especially its number ones, were less than cosy, more portents of an impending apocalypse: what I heard was that Roy Wood intended ” Blackberry Way ” as a partial parody of “Strawberry Fields Forever,” but as one fruit is darker than another, so the song. 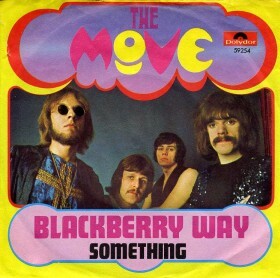 The kind of record which really only could have been a hit in midwinter, ” Blackberry Way ” is a break-up song which sees its protagonist simultaneously breaking up. 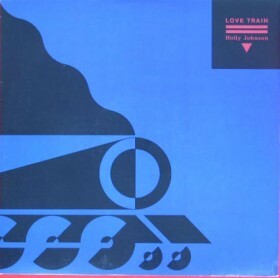 There was a Mellotron rather than a string section on the record, but its sinister pseudo-‘cello undertone (Joy Division playing the James Bond theme at quarter-tempo) and general air of weary loneness marks “Blackberry Way” as the first ELO record, even if Jeff Lynne was at this stage still the frontman of the Move’s main Birmingham beat rivals The Idle Race. The song sees Wood breaking at the break of dawn (“It’s a terrible day/Up with the lark”), his Other having precipitously fled him, though the couplet “Silly girl, I don’t know what to say/She was running away” suggests a somewhat more sinister scenario. The song’s threateningly ascending minor key creeps up on the listener’s neck like a wind of hate before mutating into a straightforward Brumbeat chorus (“Goodbye Blackberry Way/I can’t see you, I don’t need you”) and then back again to a picture through which the Nick Drake of 1969 might have wandered: “Down to the park/Overgrowing but the trees are bare/There’s a memory there/Boats on the lake/Unattended now for love to drown” though the throwaway next line (“I’m incredibly down”) seems to mock this Resnais-esque mise-en-scene. I’m finding it really hard to put these in an order of preference. Usually I listen to the medley a few times and then ask myself the following questions. Which song do I look forward to? Which song do I want to skip past? That gets me the top and bottom so all I have to do is impose some sort of arbitrary order on the remaining songs. It’s baffling that Hank regards this cheese soufflé of a cabaret cover version his greatest recorded moment but then he did become a Jehovah’s Witness (apologies to any Jehovah’s Witnesses lurking). Maybe the Shadows should have quit for good after they first split in 1969 – the group was falling apart, there were stormy arguments and walkouts, miserable tours of working men’s clubs with boozy lads yelling out “Give us Apache!” and “When’s the stripper coming on?,” a collective ARGH! when “Albatross” went to number one (“why didn’t WE think of that?”) – but Marvin, Welch & Farrar did only respectable business (though Brian Bennett was quietly building up a parallel career for himself as a session drummer and composer of library/theme music – “Chase Side Shoot-Up” from 1974 is perhaps better known as BBC TV’s golf theme) and 1975’s call-up for Eurovision was not reluctantly accepted. 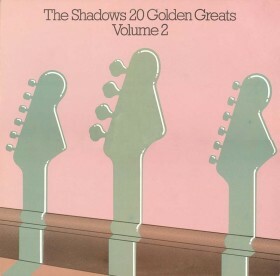 Still, the 20 Golden Greats compilation was one of 1977’s biggest sellers, so they were keen to give it another try and their audience (more or less the same one they’d had fifteen years later) loved them anew – 1979’s String Of Hits saw them back at number one in the album lists but now they were content to churn out polite covers of vaguely contemporary hits as heard in cinemas when waiting for the film to come on. Previous Previous post: Which Decade Is Tops For Pops? – Year 7 – the Number 6s.